Scott 1120-1125. Mint, Never Hinged. ALWAYS ASK FOR OUR INVOICE! ALWAYS WAIT FOR OUR INVOICE! Grenada Locomotive - The Yangtze River 1995 (miniature FDC). Grenada Locomotive - Diesel Hydraulic Korea 1995 (miniature FDC). 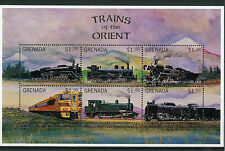 (Grenada 1996 Trains of the Orient - Mint Never Hinged (MNH). Sheetlet with 6 values (6v M/S) 3) Select each item and 'Add to Basket'. You will be back for more! 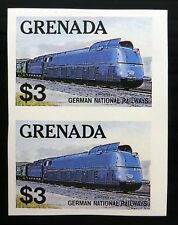 Grenada 1995 Trains of the World - Mint Never Hinged (MNH). Sheetlet II with 9 values (9v M/S II) =================================================. Condition MNH. Color Multi-Color. Country/Region of Manufacture Grenada. 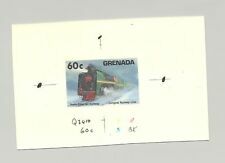 Grenada #1520 Trans-Siberian Railway, Trains, 1v. See photo (d19)(d1086). 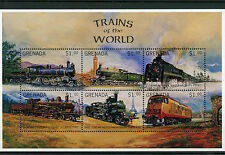 Grenada 1996 Trains of the World - Mint Never Hinged (MNH). Sheetlet with 6 values (6v M/S). 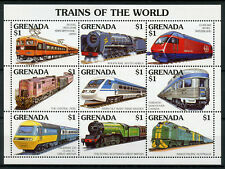 GRENADA - 1996 THE WORLD OF TRAINS / RAILWAY - MIN. Scott # 1125. Mint Never Hinged (MNH) (NH).